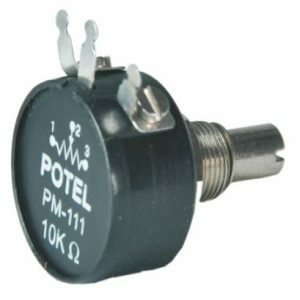 Potentiometer PM111 is a panel setting device for a maximum wattage ratting upto 1 watt. PM111 has been specifically designed to have longer life, No discontinuity and smooth movement of shaft. It has a feasibility to customize in several ways. Such as shaft modification, lug terminal arrangement, a vast range of ohmic value from 10 ohms to 30k ohms. PM111 is being manufacture using high grade engineering plastic with ROHS and FR grade approval make it competent to compete in word market. For best performance of PM111 below points needs to be taken into consideration. 2) PM111 should be mounted with Star washer given along with the product and perpendicularity between the panel and axis of potentiometer should be maintained.